Living with King Richard: Introduction to my blog. Hello, and welcome to my first attempt at 'blogging'. I have decided to start this blog as a place to record my experiences as a resident of Leicester during the exciting discovery of the mortal remains of King Richard III in a car park belonging to the local council offices. As a lover of history - and particularly medieval history - I find myself in the very fortunate position of living just a stone's throw from both the car park where King Richard was found, and Leicester Cathedral where he will (hopefully!) be re-interred, subject to the current judicial review. 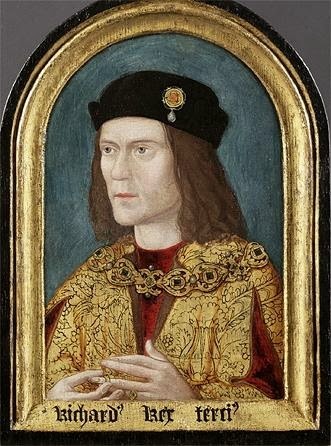 Like many people, since childhood I have always found Richard III to be a very interesting historical character, portrayed as he was by Shakespeare as a vile, deformed tyrant who murdered his nephews in the Tower! But over the years, and after reading books on the subject, one begins to realise that Richard was actually a very brave and progressive king, much loved by his subjects, and very much maligned by Shakespeare due to Tudor propaganda spread after his death. It is now only just coming to light in the public domain, after the discovery in the car park, that perhaps Richard was not as black as he was painted, but just as much a victim of the violent and harrowing medieval times he lived in as anyone else! It will take some time to get this blog up to date so please bear with me while I get up to speed! I intend to post photos I have taken over the last few months in relation to the discovery, and also relevant links and pages which you may find useful if you are interested in the subject. I am not a professional photographer, so please excuse the quality of my photos! I have quite an old digital camera which may not be the highest spec these days but is sufficient for my humble personal snaps and never lets me down! I would be happy to read any comments you would like to post, however I would ask you to please keep it constructive and not abusive. If you do not agree with something I post I do not mind you posting a comment, but please accept and respect my right to my own opinion as I respect yours. I do not intend this site to become a Leicester vs York battlefield by the way - there are plenty of other sites where you can argue away your time quite happily on this point - but please keep your negativity away from here. I am not from Leicester originally myself, I have only lived here 2 years on and off. I was born and bred in Leeds in Yorkshire, only half an hour away from York, so I have the ability to look at the issue of re-burial from both sides and take the facts into consideration, along with historical context. Without bias, without bitterness and without hysteria. I will be explaining my valid reasons for supporting the re-interment of King Richard in Leicester Cathedral in one of my posts, along with my support for the petition to the same end. This blog is meant to show what it is like living in Leicester, in close proximity to the activity, and how things are progressing in the area with regard to the discovery of King Richard III. I know many people, both here and outside the UK, have shown great interest in the archaeological dig and initial discovery of Richard, and also the further excavations in the car park. Also the plans for the prospective tomb in Leicester Cathedral and the new Visitor Centre directly opposite which will include the original grave site. I hope you enjoy reading it, and if so, you recommend it to your friends who may also be interested. Nice start, Serpie. Looking forward to your future blogs.